Pamukkale means "Cotton-Castle" in Turkish. It is a large flowstone formation created by heavily mineralized springs flowing from a hillside. The hillside is covered with bright white smoothly flowing stone, an enormous version of what you would normally find in a cave. The formations are called travertines. Hierapolis is a Roman-built city adjacent to Pamukkale. It was built there because of the springs. This was a luxurious spa town back in its day. 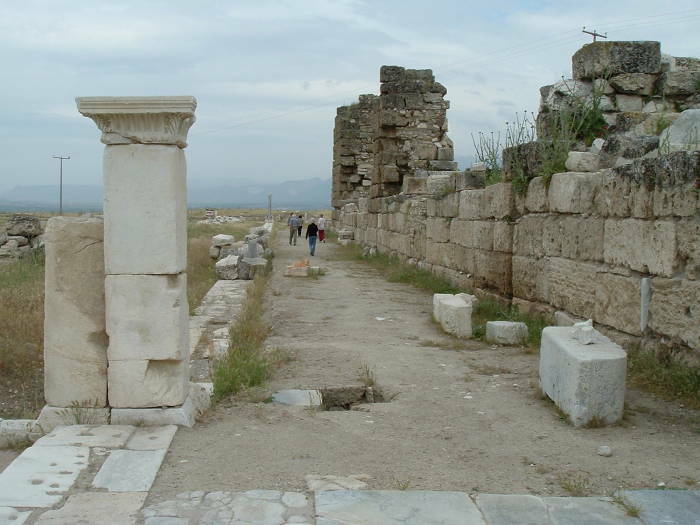 Laodicea is a Greek-Roman city a few kilometers away. Unlike Hierapolis, Ephesus, and many sites, Laodicea is almost entirely unrestored, so you can get the feeling of the Indiana Jones experience. 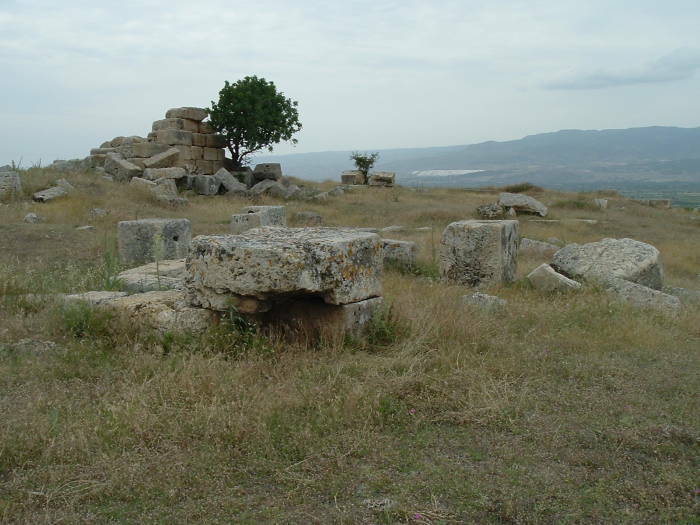 These three sites are all very close to the city of Denizli in south-western Turkey. U.S. Government map of Turkey showing location of Denizli. Denizli has good bus connectivity to south-western Turkey and even good overnight train service with İstanbul. Pamukkale has a wide range of housing options. Pamukkale is a good base for a day trip to Aphrodisias. Many of the pensions there can put you on the daily organized van trip. If you're not going to stay another night in Pamukkale, you could store your bag at the pension, return from Aphrodisias in the late afternoon, and then take an early evening bus out of Denizli to Selçuk and Ephesus. You could continue on to Antalya at that point if you are going to stay overnight there, but would probably be too late to continue directly onward to Olimpos. 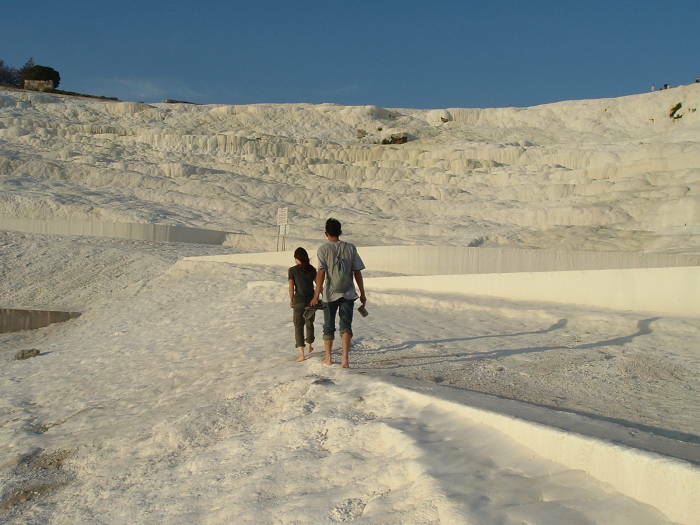 We have walked part way up the white flowstone of Pamukkale. The total area covered is about 600 meters wide and up to 160 meters high. 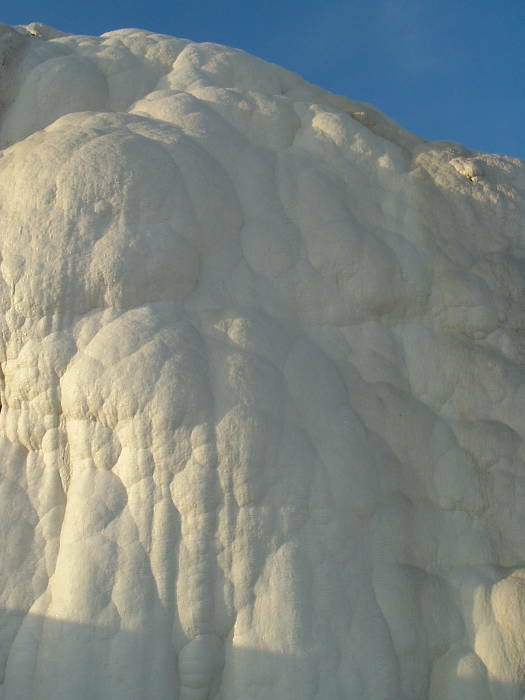 Its size and bright white color make it visible 20 kilometers away in the town of Denizli. The springs are just over the crest of the hill, near the trees and beyond, up to a kilometer away along the face of the hill. 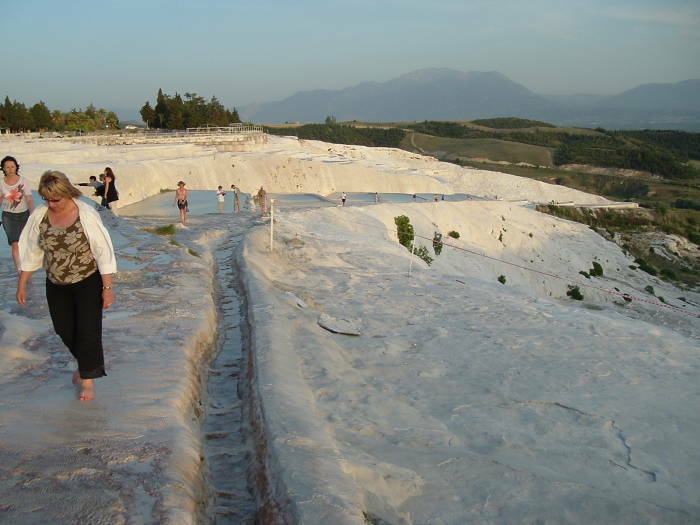 Pamukkale had become heavily commercialized, and motels lined the crest of the formation. People ran around on the flowstone in shoes, tracking dirt everywhere and tearing up the travertine formations. 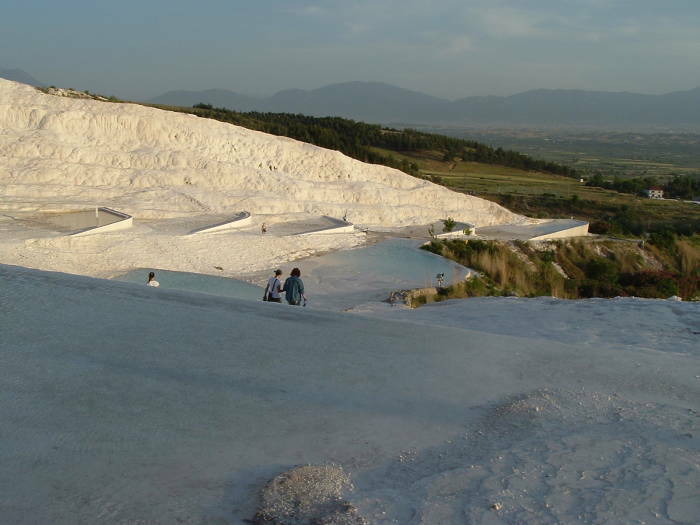 Pamukkale became a national park a number of years ago and the motels were closed and demolished. You can go on the flowstone, but you have to remove your shoes at the ticket booth. The stone is very sharp — you have to walk gently unless you have very tough feet. The water keeps flowing down over the stone, gathering in a number of pools. Some are natural, some are man-made. 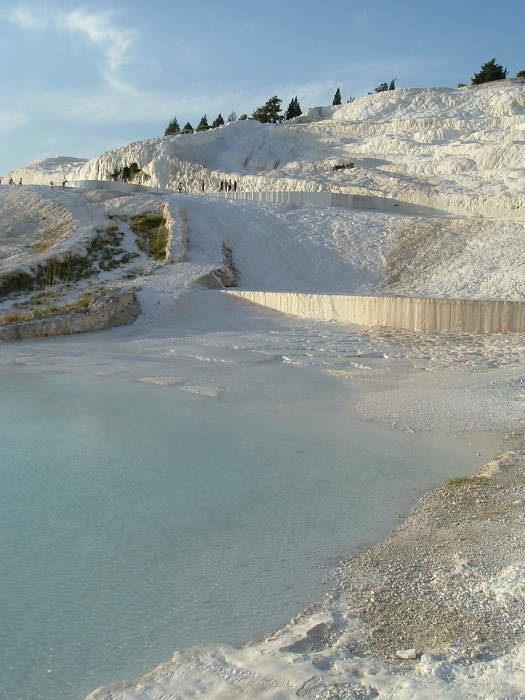 They are slowly restoring Pamukkale to an all-natural state. 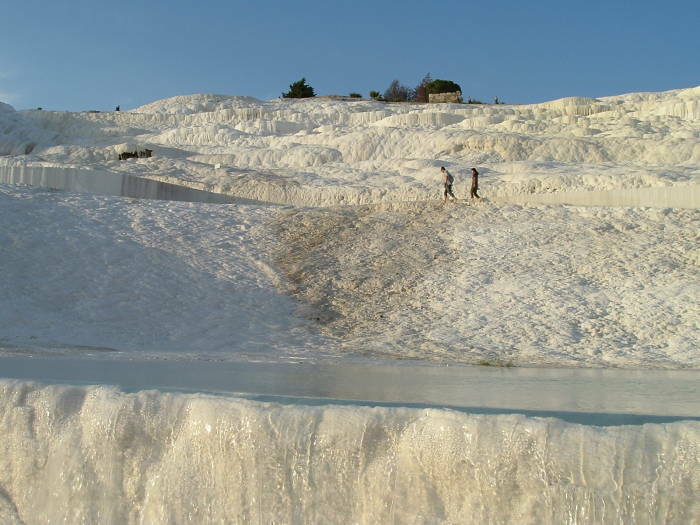 Pamukkale was declared a World Heritage Site in 1988, leading eventually to the removal of recent "improvements" and slowly returning it to a natural state. The formation has a very abrupt edge. It is bright white right to its edge, and then the surrounding terrain is green and brown. It looks very strange, whether you are on the formation looking out, or looking at it from a distance. Here is a closer view of the flowstone. There are 17 hot mineral springs on the hillside above the formation. Water leaves those springs at temperatures from 35°C to 100°C (95-212°F). The water is supersaturated with calcium carbonate and carbon dioxide. As the water is exposed to the air, carbon dioxide degasses and calcium carbonate is deposited. The water contains approximately 725 milligrams of carbon dioxide and 1200 milligrams of calcium carbonate per liter as it emerges from the spring. After it has flowed across the travertine formations and continues in channels toward and through the small town at the base, those levels are down to approximately 145 and 400 mg/l, respectively. There's also some radon in the water, 1480 pCi per liter as measured at one pool. The water flows over the stone in thin sheets, and also gathers in channels. The water channels eventually lead through the village of Pamukkale, just out of view to the right. The water flowing thinly across the surface rapidly cools, degasses, and deposits calcium carbonate. The water flowing swiftly in the channels does so less quickly. Step in the channel, and you find that the water is very warm. The water runs through the village through channels made from concrete irrigation components. They quickly get a bright white coating of calcium carbonate. Pamukkale is lighted at night, and you can visit at any time of day or night. 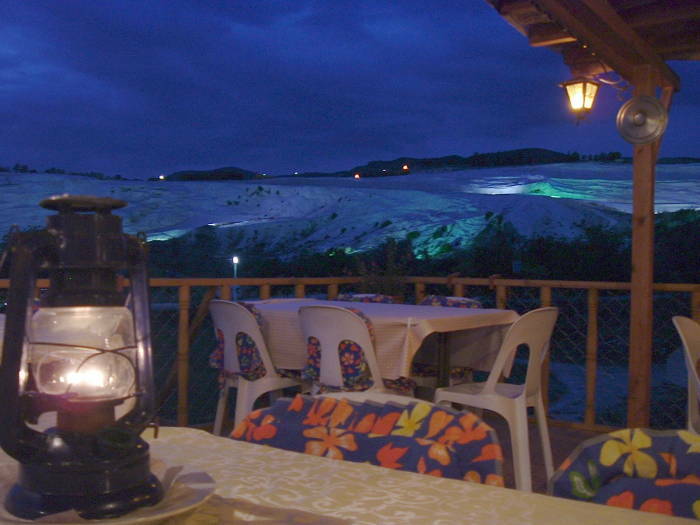 I'm seated on the terrace of a restaurant in Pamukkale village, where the flowstone looks like a ski area at night. 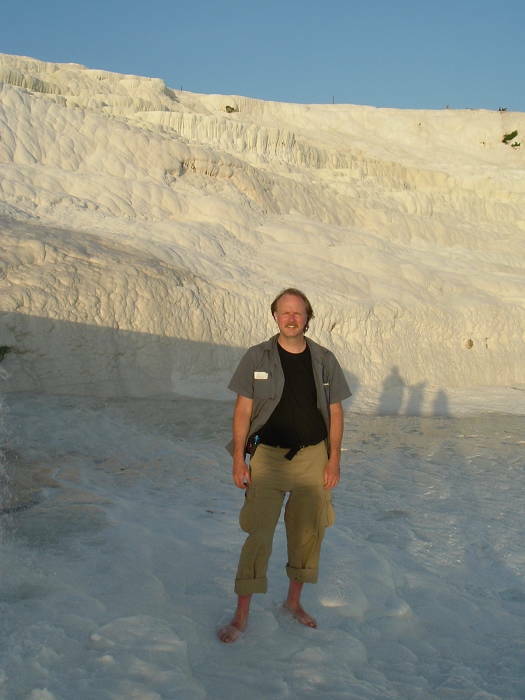 The pictures at Pamukkale were from a late afternoon visit. 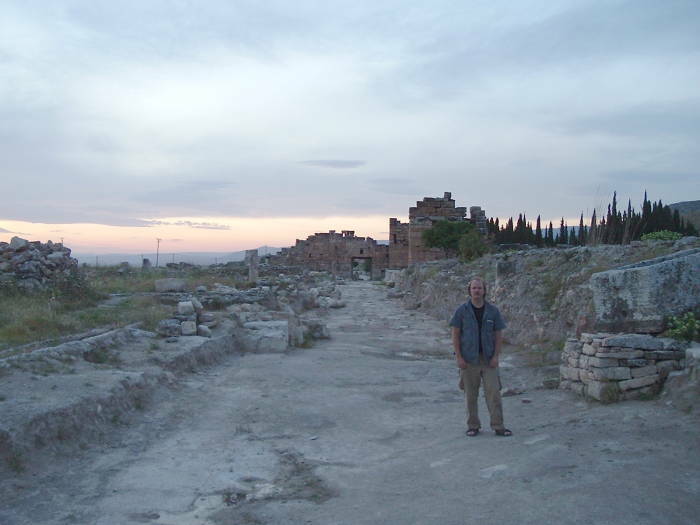 Then the below pictures of Hierapolis were taken during and after sunset. This picture is later that same evening, while I was getting dinner back in the village. 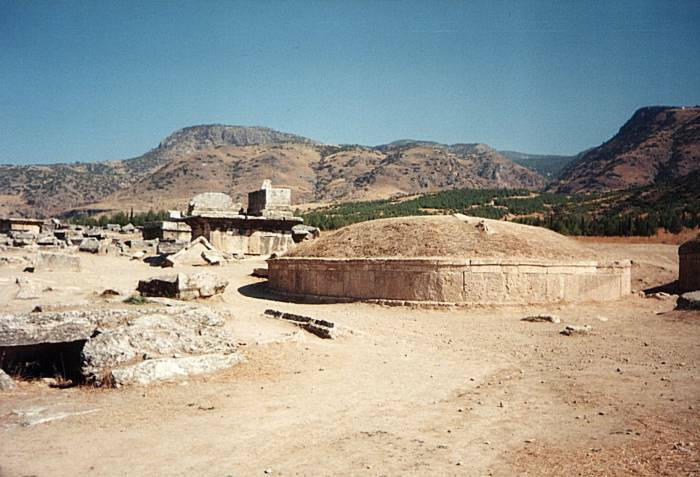 The Greeks and Romans were very interested in warm mineral springs, and the city of Hierapolis was built just above the flowstone formations. The city's name is from the Greek, Ίεράπολις, meaning "Holy City" in reference to its many temples. The springs were used as a spa since the 2nd century BC. Below is the theatre at sunset. It has fifty rows of seats and a facade over 90 meters wide. One version was in around 62 AD, what we see here was finished in 206. The 50 rows of seats are divided into sections by eight stairways. By the mid 300s, aquatic shows had become popular and the lowest area was converted so it could hold water. The stage is over 3.5 meters above the floor, so the water could have been deep enough for early versions of water polo had the Romans been interested. The city was quite large. This wide main avenue joined various districts as it ran about 1500 meters roughly north to south along the length of the city. The avenue was about 13.5 meters wide with an arcade of shops running down both sides. 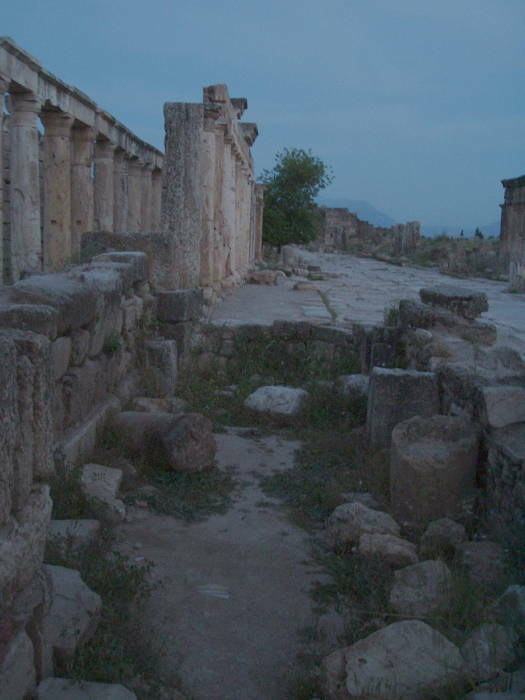 People came to Hierapolis to soothe or cure their ailments, and many of them retired here. Continuing down the broad avenue behind me, you leave the city of the living and pass into the Necropolis, the City of the Dead, the large cemetery just outside town. The city (of the living, that is) grew to a population of 100,000, making it a major city of the Roman Empire. It was prominent in the arts, philosophy, and trade, plus, of course, medicine. Here are some of the public baths and latrines along the main avenue. 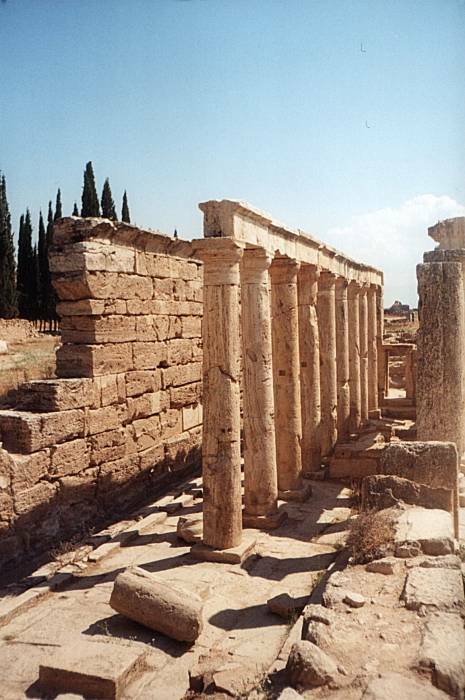 During Hellenistic times they built a temple to Apollo Lairbenos, the principal deity of Hierapolis. This localized version of the Greek god Apollo was linked to the ancient Anatolian sun god Lairbenos, and to Kareios, the god of oracles. The temple to Apollo-Lairbenos was intentionally built over an active fault, connected to the Plutonian cave where the gases killed uncautious explorers. That's "Plutonian" as in its dedication to the deity Pluto, not as in any intentional connection to Pu 239 or other isotopes. Also see the more famous Temple of Apollo at Delphi for another example of a temple to Apollo being built over a gas-releasing geologically active feature. 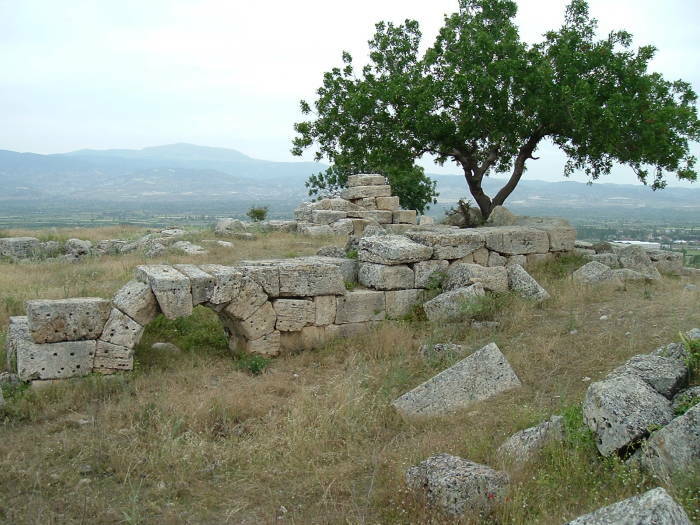 The Plutonium or Πλουτωνειον, "The place of Pluto", was described along with its use by a number of ancient writers. It is a small cave, with an opening just large enough for one person. Stairs descend into the cave, suffocating carbon dioxide gas comes out. Beyond a small roofed chamber is a deep crevasse from which hot water swiftly emerges while releasing a sharp smelling gas plus plenty of carbon dioxide. In the earlier years of the use of the site, castrated priests of the Mother Goddess Cybele would descend into the Plutonium. The trick was to hold their breath while they crawled along the floor to stand up in pockets of oxygen. Carbon dioxide is, of course, heavier than oxygen, being CO2 rather than O2. They would come back out after a while, convincing everyone that they had just seen a miracle. Therefore the priests had divine protection and superior powers, and were worthy of high fees for answering questions posed to the Oracle of Pluto. There was an enclosed area of about 2000 square meters directly in front of the cave opening. It was filled with the suffocating carbon dioxide gas, rendering unconscious and then killing any people or animals who stayed in it for very long at all. The priests sold birds and small animals to visitors, so they could verify for themselves just how deadly the gas was. All this made a lot of money, but it did not sit well with the leaders of the new religion of Christianity. The entrance to the Plutonium was filled with rubble during early Christian times. In the foreground is a small Christian chapel built into the Frontinus Gate along the main avenue. Some of the public baths and latrines are just beyond it. In the distance, behind the tree, is the next major gate along the main avenue. 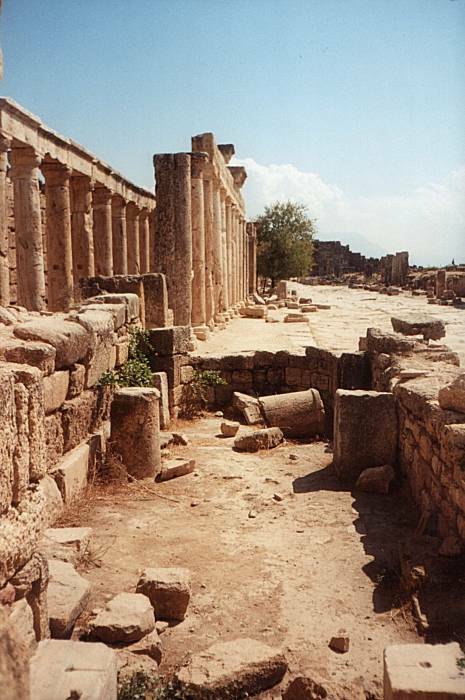 Hierapolis is thought to be the site of the martyrdom of Φίλλιπος, Philip to English speakers, listed as one of Jesus' 12 Apostles. He appears most prominently in the Gospel of John, but is also described in all the Synoptic Gospels. 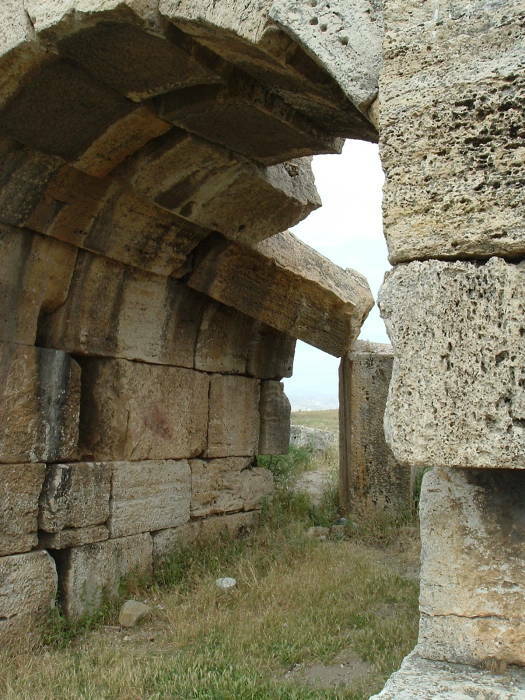 The tradition is that he preached in Syria, Greece, and here in Phrygia, and then was killed here around 80 AD. However, the traditions come from a variety of hagiographies written long after his death, and some of them clearly confuse him with another prominent Philip. For example, there are two competing traditions about his martyrdom in Hierapolis. One says that he was beheaded. The other that he was crucified upside-down and continued preaching from his cross. A Martyrium, a church serving as a monument to a martyr, was built in the 5th century after Christianity had been officially accepted in the Byzantine empire. It was roughly square, about twenty meters on a side, with a central chapel surrounded by eight chapels and other rooms. It burned down at the end of the 5th century or early in the 6th century. It was believed to have been built over and around Philip's grave. "This year, we have started the excavation in another place near the martyrdom of Saint Philip. And we have found immediately another church but different from the previous church because of its round plan. This is in three-edges and was covered by not a dorm but a normal roof. And in this tomb, in this church we have found a Roman tomb. But this Roman tomb was very much honoured, it was the center of this church. The church was built in the 5th century by the Emperor Theodorus because we have found an inscription from Emperor Theodorus, so also the connection between this place and the palace of the emperor is another argument to prove that these places are connected with the Apostles of Jesus as Ephesus is. Now we are sure because we have worked on this problem for thirty years and explored all the area. This is the site of Philip's tomb. It's sure now we have one tomb that is connected with a very big church and was very prominent in this context. So we can recognize now the tomb, the center of this system, is the tomb of Saint Philip. We are just beginning our work here but I'm sure that many other elements will come from this site, from this church, and we wait to see maybe an inscription, maybe some other objects that can prove more and more and more this wonderful reconstruction of our religious, cultural and historical tradition." 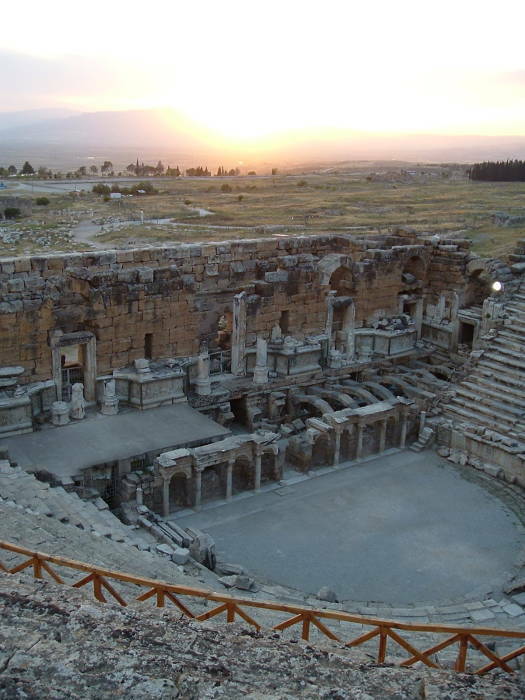 The pictures above were taken with a digital camera during a visit at the end of the day: exploring Pamukkale in the late afternoon, seeing the sunset from the large theatre, and continuing north as dusk fell. The four pictures below are from an earlier trip. They were taken with a cheap film camera, but they're brightly lit. At right we see that chapel during the day. In the distance we see one of the monumental gateways at either end of the central part of the main avenue. They are massive, with square towers on either side. This chapel is built against the interior side of the Frontinus Gate, which has three arches flanked by cylindrical towers. It's bulky and dramatic, but the gates closer to the center are even more so. These public baths and latrines are built against a solid wall just inside the Domitian Gate. The latrines were a long row of marble seats with oval holes, with a channel running below them to carry away waste. 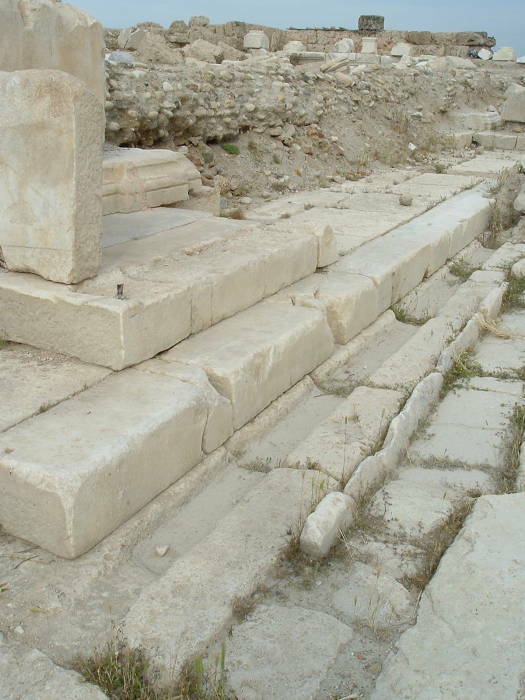 The public latrines at Ephesus are more completely preserved, with the marble seating still in place. If we turn and continue on to the north, exiting the main core of the city through the Frontinus Gate, we follow the main avenue out through the outermost gateway. We pass the Thermae extra muros or the Hot spring outside the city wall, and enter the Necropolis, the City of the Dead. This large cemetery extends for over two kilometers along the old road to Phrygia and Sardis, and also extends around the city walls on the east or uphill side. 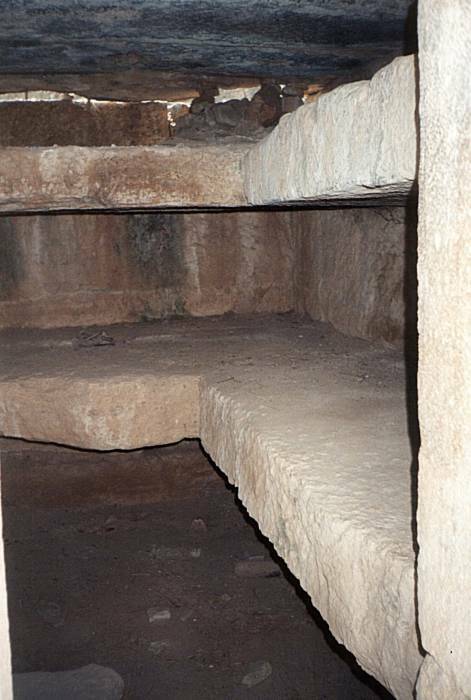 About 1200 of these tombs have been excavated. Some of the tombs are tumuli, low mounds as seen in the foreground above. A circular stone wall surrounds the tomb, which is accessed through a small tunnel. Others are very simple graves carved into the rock for common people. More elaborate single graves are sarcophagi, elaborately carved box-like tombs, most of them made from marble and often with a double-pitched roof. Most were covered with carved reliefs and epitaphs displaying the name and profession of the deceased and listing their good deeds. Most of the sarcophagi were plundered, but the epitaphs have revealed a great deal of information about the people and life in the city. For example, the sarcophagus of a mill operator named Marcus Aurelius Ammianos shows that he operated a saw mill. It illustrates this with a diagram of a mill wheel driving a gear train and cranks and connecting rods to power two saws cutting rectangular blocks. This is the earliest known example of this type of machine. Other tombs are larger, for an entire family. Some of them resemble small temples, like some of those visible in the distance above. Shelves inside held the numerous bodies. You pay based on how far you are going in a dolmuş. Tell the driver that you want to get out at Laodikya. He will bill you accordingly and let you out at the right spot along the highway. From there it's maybe a kilometer back a side road to Laodicea. 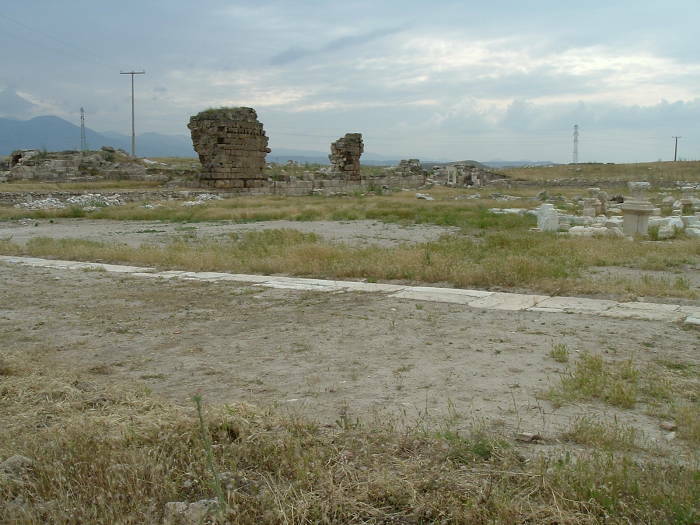 Laodicea is along the road between Denizli and Pamukkale. It's maybe 10 kilometers from Pamukkale and 5 kilometers from Denizli. There is frequent dolmuş (minibus) service along the road. 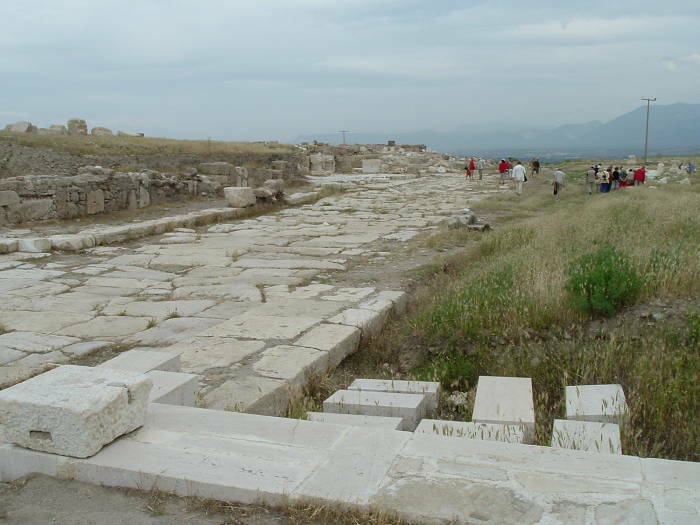 Laodicea is built along a ridge extending from a hilltop, between narrow valleys of the Asopus and Caprus streams flowing down to the Lycus river. It was originally known as Diospolis, the City of Zeus, and Rhoas or Ροας after that. All that was when it was part of Phrygia Pacatiana, or Caria, or Lydia. Borders shifted and sometimes they were vague. The city was renamed Laodicea on the Lycus or Λαοδίκεια προς τοϋ Λύκου when it was rebuilt in its current location under Antiochus II Theos in 261-253 BC. It was named after his wife, Laodice. With that name being Greek, there are different spellings: Laodicea, Laodiceia, or Laodikeia for English speakers, Laodicea ad Lycum if you prefer Latin, or Laodikya to the modern Turks. We have reached the outskirts, and turned to our right to look north toward Pamukkale. That white streak in the distance is the large travertine formation of Pamukkale. 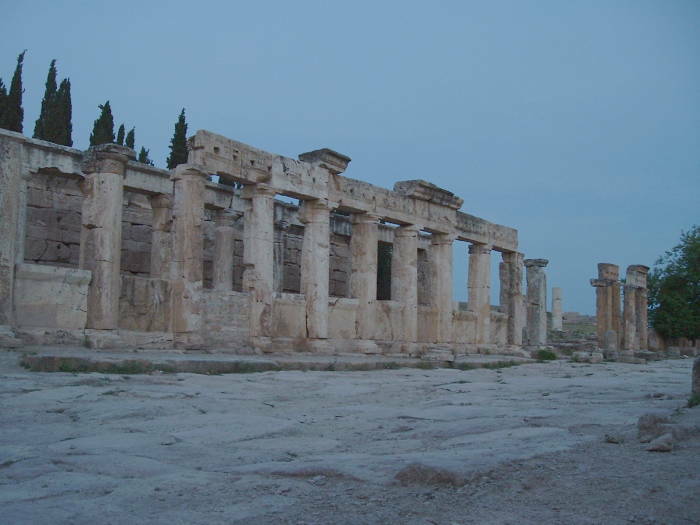 Unlike many other historical sites, Laodicea is almost entirely unrestored. And, there are no signs explaining what's what. That's a nice change from the usual. Laodicea managed to become reasonably prosperous and well known without becoming especially important. Achaeus was its king in 220 BC, and it had come under the control of the Kingdom of Pergamon by 188 BC. Roman control had spread to here by 133 BC. From late Roman Republic times and under the early Roman Emperors, Laodicea became more prosperous and quite important. It was located on a major trade route with the broad and flat Meander River valley extending west to the Aegean shore. 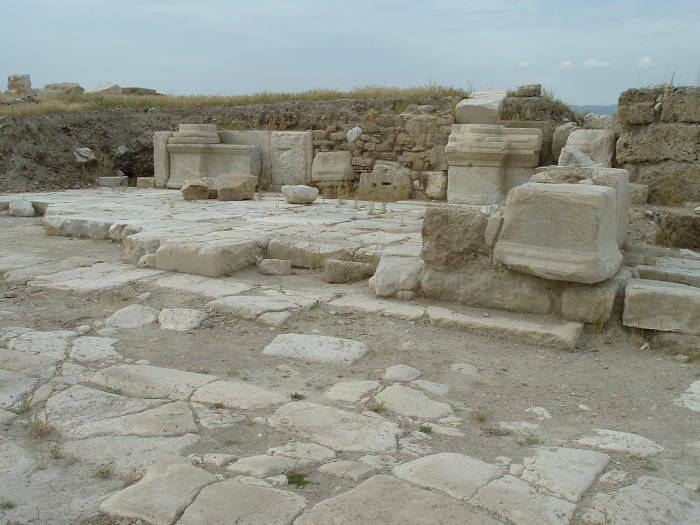 Laodicea gradually became one of the most important commercial cities in Asia Minor, trading in regional goods (especially wool) and hosting major financial transactions. The central agora would have been the site of much of that commerce. It has a central open area (that's what agora means! ), roughly square, surrounded by covered porticos. Business would have been transacted in shops under the portico and in the open center. If you're using GPS, the central agora is at UTM 35S 0685565 4189734. A few visitors make it, as you see here, but far fewer than you see at Pamukkale and nowhere near the bus loads that surge into Ephesus for brief visits. Roman era Laodiceans were wealthy enough to acquire and indulge a taste for Greek art and culture. The city also was home to some science and literature, and it had a significant medical school. Coins were minted locally showing that the locals worshipped Zeus, Æsculapius, and Apollo, plus the obligatory nod to the deification of the Roman Emperor. Below is another view across a corner of the agora. We're looking a little west of south. To the left are the mountains south of Denizli. The open horizon to the right is our view down the broad valley of the Meander river, a natural transportation route between here and the Aegean coast. Some people want to visit all seven of the churches to whom The Revelation of Saint John the Divine was specifically addressed. Or as they're more dramatically called, the Seven Churches of the Apocalypse. If you're interested in church history, Laodicea is one of them, along with Colossae, about 17 kilometers to the east. Of course, back then, "church" referred to a community and not to a structure. Some people, especially followers of the peculiar Rapture belief originating in the late 1800s in the U.S., expect to find the ruins of enormous church buildings. The historian Josephus wrote that Antiochus III the Great, ruler of the Seleucid Empire, transported 2000 Jewish families from Babylon to Lydia and Phrygia some time during his rule of 222-187 BC. They were later joined by more Jews from Palestine. Early Christianity was largely a Jewish movement, and so Laodicea became an early base of Christianity. The city is mentioned in passing in Paul's Epistle to the Colossians (who lived to the north), and Laodicea is also one of those seven churches of Asia Minor to whom John's Revelation is addressed. In the first of those, it seems that the Laodicean church group had been founded by the 50s AD by a man from Colossae named Epaphras. At the time the letter was written, Epaphras shared its leadership with Nymphas, and the church group met in Nymphas' home. It's not known if Nymphas was a man or a woman, but many of the early Christian church leaders were women. So, don't go looking for a church building, try to figure out which small home belonged to Nymphas. But don't expect to find that specific home! Epaphras, who is one of you and a servant of Christ Jesus, sends greetings. He is always wrestling in prayer for you, that you may stand firm in all the will of God, mature and fully assured. I vouch for him that he is working hard for you and for those at Laodicea and Hierapolis. Our dear friend Luke, the doctor, and Demas send greetings. Give my greetings to the brothers and sisters at Laodicea, and to Nympha and the church in her house. After this letter has been read to you, see that it is also read in the church of the Laodiceans and that you in turn read the letter from Laodicea. There's an apocryphal Epistle to the Laodiceans purporting to be the letter from Paul mentioned in her letter to the Laodiceans. Apocryphal, meaning that early theologians and historians decided that it probably wasn't the real letter (or, in some cases of apocryphal works, that it might have been the real thing but it wasn't significant enough for inclusion in the official canon). There are copies of this Epistle to the Laodiceans in Latin and translations into other languages. You can find copies and some commentary here and here. Also, some Greek manuscripts close Paul's First Epistle to Timothy with: "Written at Laodicea, metropolis of Phrygia Pacatiana." The city continued to prosper into Byzantine times. Many Byzantine writers mentioned it. The city hosted a regional synod around 363-364, when about thirty clerics from throughout Asia Minor gathered here to decide on official rules regarding proper behavior of clerics and laypeople, how to deal with heretics and pagans, moving away from the Jewish sabbath toward Sunday as a day of rest, specifying details of the Biblical canon, and setting up some liturgical practices and restrictions during Lent. An English translation of the full text produced by this meeting is available here. The list defining the Biblical canon omitted John's Revelation from the New Testament, and included the Book of Baruch and the Epistle of Jeremy in the Old Testament, so this definitely was not the final list. Ίωάννης Άξούχ or John Axouch, was commander-in-chief of the Byzantine Army under Emperor John Komnenos. He was a Turk by birth. He had been captured as an infant by Crusaders at Nicaea in 1097, given as a present to Emperor Alexios I Komnenos, and raised in the imperial household. He was a constant childhood companion of the Emperor's son John. When this son succeeded his father as Byzantine Emperor John II, he appointed his childhood friend as megas domestikos, a chief advisor. The Seljuk Turks had seized Laodicea, and John Axuouch conducted a siege in 1119. Emperor John II was an active soldier who often took part in military campaigns. John Axouch's siege allowed a swift victory once the Emperor joined the battle. The following Byzantine Emperor, Manuel I Comnenus, fortified Laodicea. However, it was destroyed by invasions of the Turks and the Mongols. 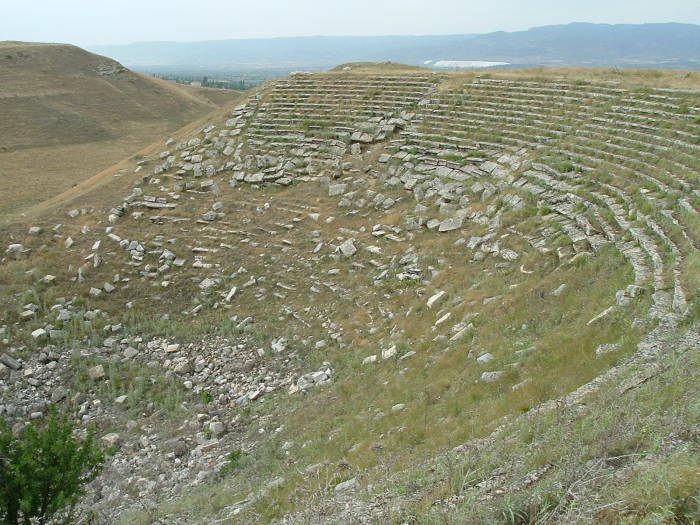 Here is the better preserved of the two large theatres in Laodicea. Compare this to the much more heavily restored theatre at Ephesus. Pamukkale is again visible in the distance.